I love all things Disney. That's pretty obvious if you take a closer look around here. It's a place that we travel to almost every year and I have so many photos and memories from this magical place. I love that Studio Calico's Starlight kit was perfect for some of those stories. Let me share a few. And then there's this one from Disney's Typhoon Lagoon park. My favorite waterpark of all time! And then there's this little oddball. I used the Fall Document add on to document these photos from the pumpkin patch last year. I have to get in at least a little bit of the current season in there! These were all my project for the Studio Calico gallery this month. Mostly magical, with a side of fall goodness! Thanks for stopping by. Hey there, welcome to the final day of the October Neat and Tangled release. 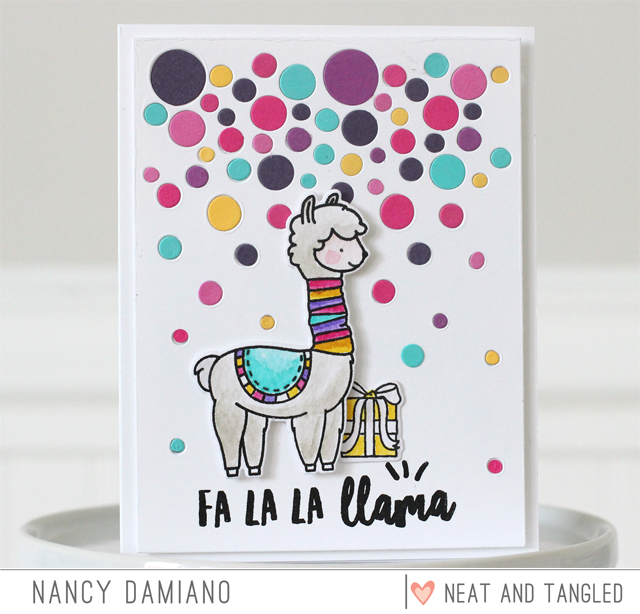 Today we have the cute Fa La Llama stamp and steel die set along with the circles background die! This one is all about a funny pun and a very different spin on a holiday card. I used the Neat and Tangled Circles Steel Die to set the background of the card. 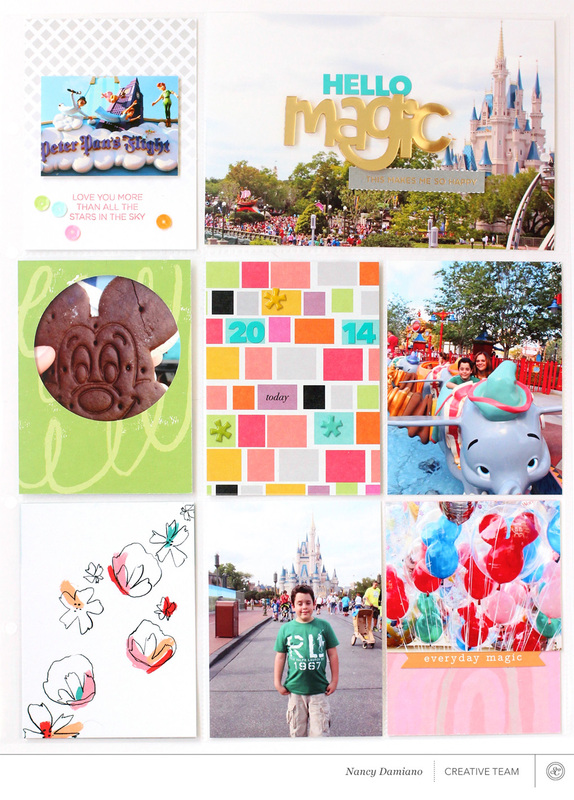 I then filled in each hole with bits of brightly colored cardstock. 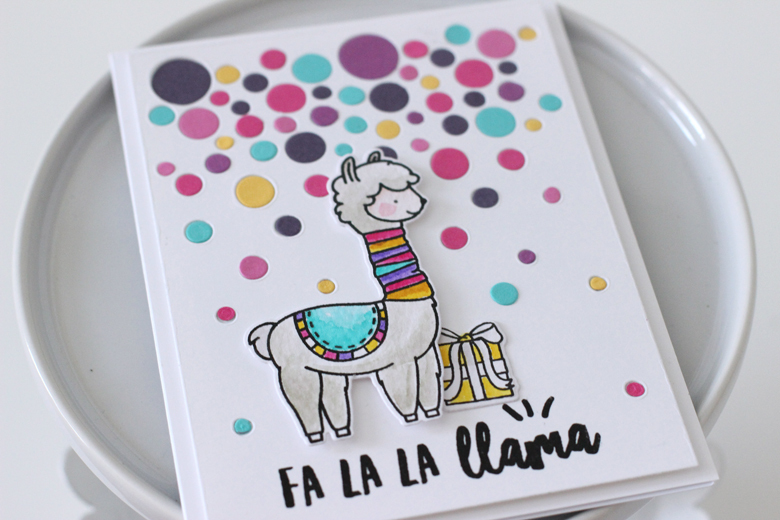 The cute llama from the Fa La La stamp set was watercolored with Distress Inks and placed in the center of the card. The final touch is the pun - my favorite part! Neat and Tangled will be giving away a Hello Winter stamp set. To enter, leave a comment below to be entered. Tell me what's your favorite stamp from this release was. Visit the Neat and Tangled blog on Friday for a list of winners. Best of luck and thanks for stopping by. Hey there, welcome to the third day of the October Neat and Tangled release. 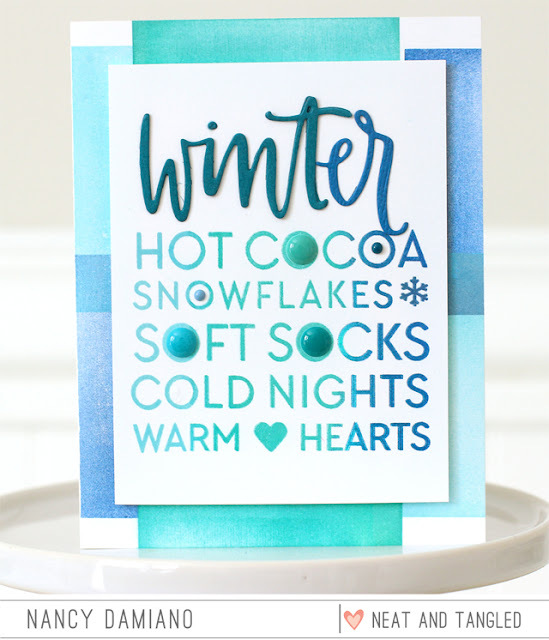 Today we have the Hello Winter stamp and steel die set along with the large background stamp! This one is all about whimsical winter and bold color. I used the Neat and Tangled Hellow Winter stamp set to stamp a sentiment in shades of blue right in the center of the card. The large blocks of color were created with the background stamp and the same shades of blue. The steel die was used to cut the title in teal and cobalt. Finally, a few enamel dots were used to add some texture. 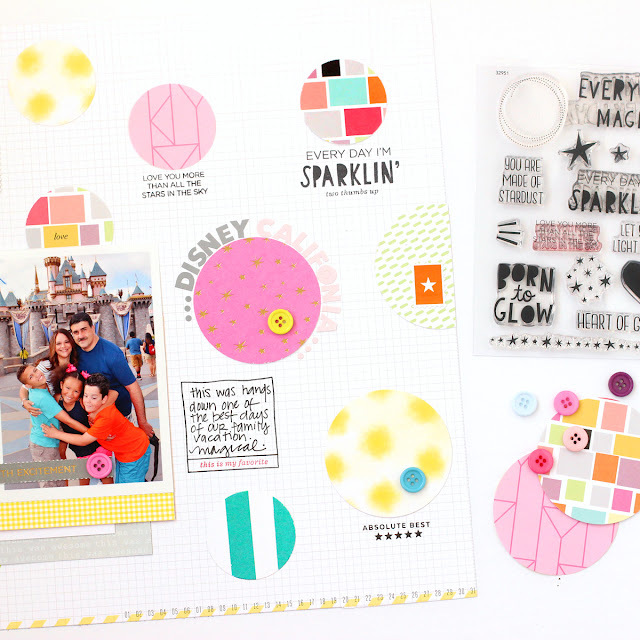 Neat and Tangled will be giving away a Hello Winter stamp set. To enter, leave a comment below to be entered. Tell me what's your favorite thing about the winter season is! Visit the Neat and Tangled blog on Friday for a list of winners. Best of luck and thanks for stopping by. 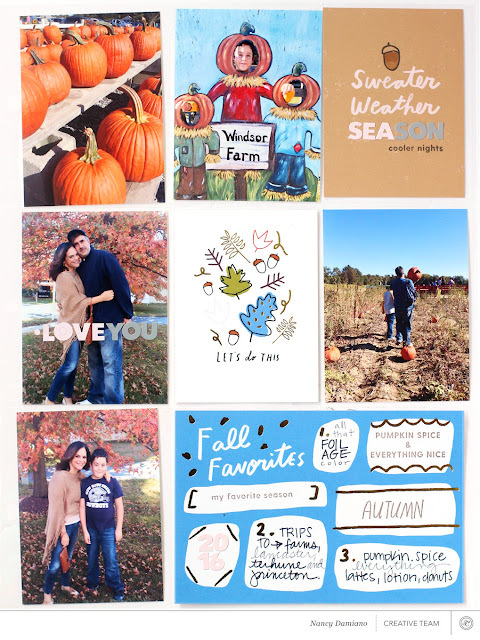 It's that time of the year again when we start planning out holiday cards! Christmas is my favorite season to send handmade cheer to those I love. 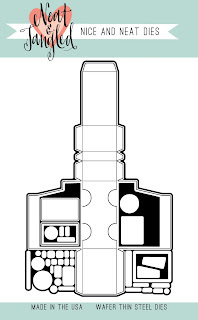 Let's take a closer look at the Fireplace Shaped Steel Die Set. I created this card starting with a white fireplace background. This gave me a nice, clean slate to work on. To decorate, I began with the inside of fire pit and created a bold, colorful look with "bricks" in aqua tones and gray. Next, I stamped the sentiment in the upper right hand corner of the mantle. 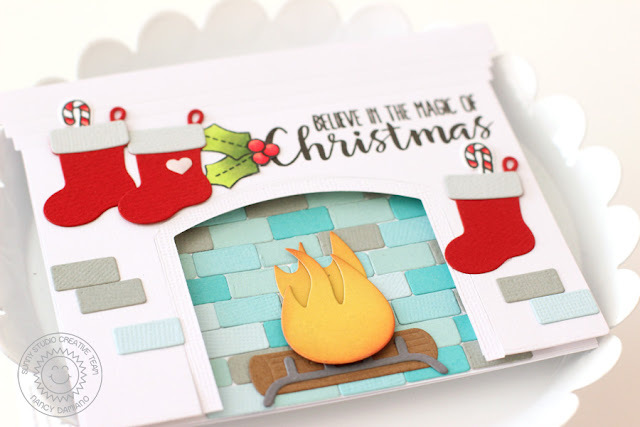 The flames and logs were layered in the center of the fire pit and give the card a touch of warmth. A few red stocking were hung with care, some with candy cane treats and an enamel heart. A sprig of holly stamped from the Christmas Icons set finishes off the card. 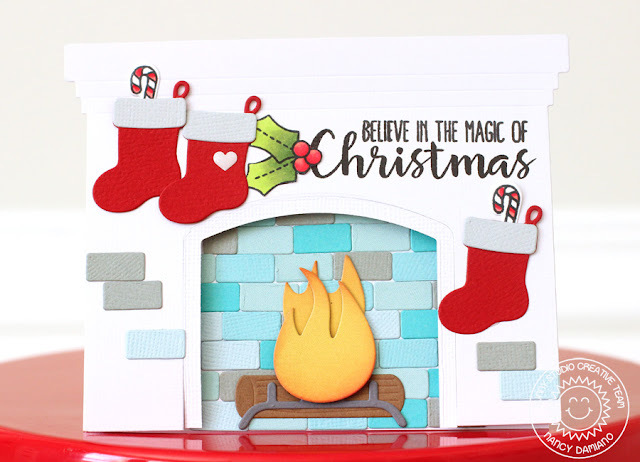 Decorating mantles of all different types is a fun way to use the Fireplace Shaped Steel Die Set. You can go with traditional red bricks or give it a playful aqua twist - customization is endless here! Hey there, welcome to day two of the October Neat and Tangled release. Today we have the large Truck Steel Die Cut. 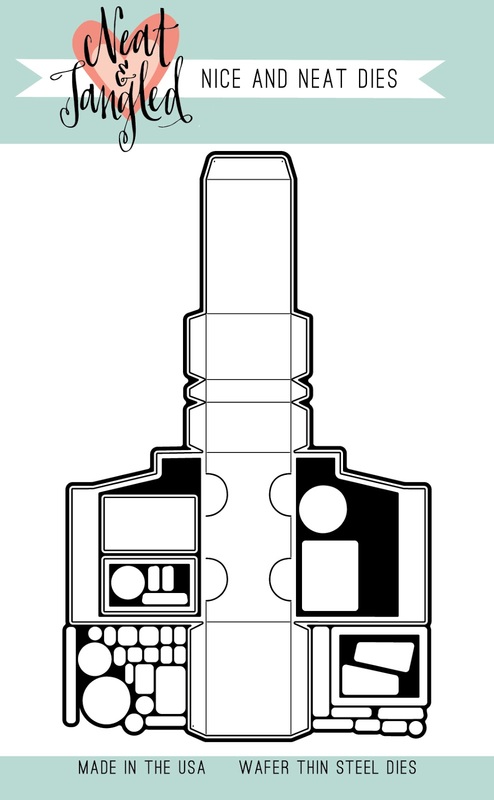 This is an extended die and requires long plates. 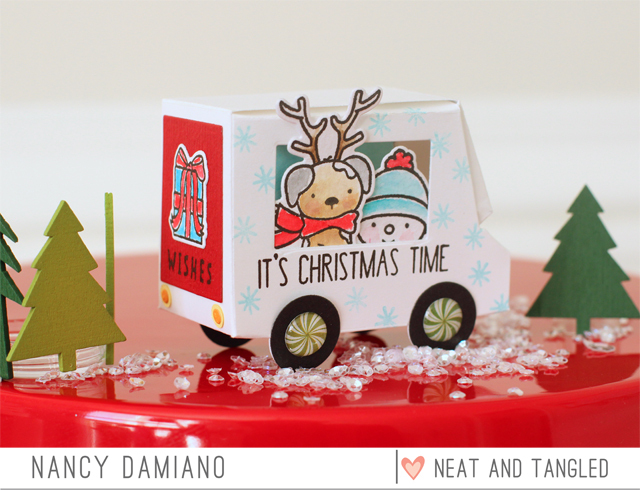 It creates the cutest little trucks that can hold candy, small toys and holiday notes. It creates the cutest little trucks that can hold candy, small toys and holiday notes. Here's an example of a small white truck I created using the die. I stamped it with a subtle blue snowflake print and a sentiment right on the truck. The Neat and Tangled Get Yeti stamp set was used to create two little snow friends peeking out of the window. This is a simple, fun Christmas project perfect for all of your holidays needs! Neat and Tangled will be giving away a Truck Steel Die set. To enter, leave a comment below to be entered. Tell me what's your favorite holiday treat is. Visit the Neat and Tangled blog on Friday for a list of all of the winners. Good luck and thanks for stopping by! Neat & Tangled October Release Day 1 | Get Yeti for Christmas! Hey there, welcome to the first day of the October Neat and Tangled release. 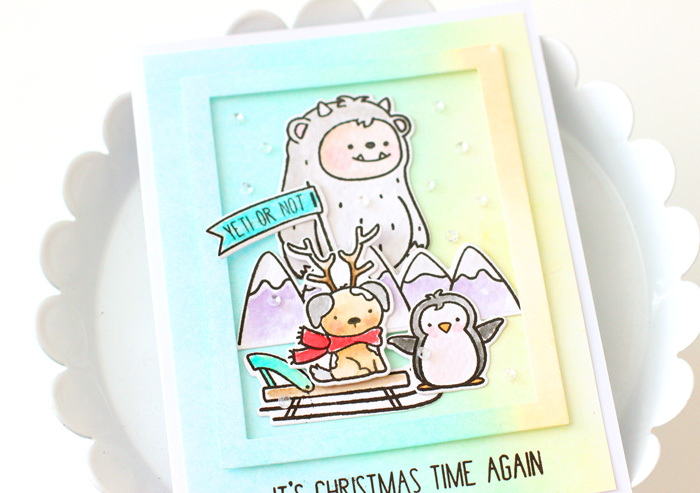 The first stamp set up is called Get Yeti and it's all about whimsical winter and Christmas. I love all of the different scene possibilities included in this set. Icons likes these that are easy and fun to color are my favorites. I used the Neat and Tangled Get Yeti stamp set to create this fun Christmas themed card. The base of the card was created by blending Distress Inks in Peacock Feathers, Tumbled Glass and Squeezed Lemonade. There's a bit of green where the yellow overlapped with the blue. Next, a scene was created with a giant yeti peeking from behind purple mountains at this wintery scene. The stamped icons were all watercolored using Distress Ink. A christmas sentiment stamped in black at the bottom of the card and a sprinkle of clear sequins mimicking snow complete the card. Neat and Tangled will be giving away a Get Yeti stamp set. To enter, leave a comment below to be entered. Tell me what's your favorite watercolor brand is. Visit the Neat and Tangled blog on Friday for a list of winners. Good luck and thanks for stopping by!